Deer (plural and singular) are the members of the Cervidae family of the order Artiodactyla, or even-toed hoofed mammals, with two large and two small hooves on each foot. Members of the Ruminantia suborder, they are ruminants; that is, they digest their food in two steps, first by eating the raw material and regurgitating a semi-digested form known as cud, then by eating the cud, a process called ruminating. Other ruminants include cattle, goats, bison, and antelope, as well as camels and llamas, which are members of the Tylopoda suborder. The deer family, Cervidae, includes elk, moose, caribou or reindeer, muntjac, red deer, and white-tailed deer, among others. Deer are one of the most successful families of large animals. They are widely distributed, with representatives in all continents except Antarctica, although few are found in Africa and the Australian population derived from introduced species. The Red Deer, one of the largest species of deer in the world, is found in the Atlas Mountains region of northwestern Africa, being the only species of deer to inhabit Africa. Extinction is a natural part of the history of life. Such is the case of the Irish Elk, the largest known species of deer, which disappeared about 11,000 years ago, largely from natural rather than anthropogenic factors. However, the popularity of some deer as game animals for sport hunting has also lead to great pressures on their numbers from human causes. At one point, the white-tailed deer in North America was driven almost to extinction in certain areas. Remarkably, however, this species has not only have survived, but are currently prospering, being added by, among other factors, the removal of large predators and the presence of more available food. This, in turn, has presented its own problems in terms of crop damage and great numbers of deer-automobile collisions. Other species are sometimes called deer, but are not true deer in that they do not belong to the Cervidae family. 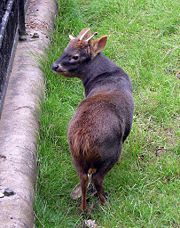 The similar musk deer of the Moschidae family and the mouse deer of the Tragulidae family do not have antlers. Most species of deer live in forested or partly wooded areas, although some live in grasslands, marshlands, and tundra. Deer are selective feeders. Most feed on leaves. They have small, unspecialized stomachs compared to other ruminants, and high nutrition requirements: ingesting sufficient minerals to grow a new pair of antlers every year is a significant task. 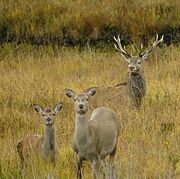 Rather than attempt to digest vast quantities of low-grade, fibrous food as sheep and cattle do, deer tend to select easily digestible shoots, young leaves, fresh grasses, soft twigs, fruit, fungi, and lichens. Deer vary in size from the Southern pudu (Pudu pudu), which stands about 35 to 40 cm (14 to 15 inches) tall at the shoulder and weighs about 9 to 15 kg (20 to 33 lbs), to the moose (Alces alces, called elk in Europe), which stands about 140 to 235 cm (4.6 to 7.8 feet) tall and weighs about 200 to 825 kg (440 to 1815 lbs) (Huffman 2006). Red Deer (Cervus elaphus) is one of the largest species of deer in the world, after Alces alces and Cervus canadensis(Elk or Wapiti) of North America and East Asia. The Irish Elk (Megaloceros giganteus or Megaceros) is a huge extinct deer and the largest known species of deer to have ever lived. It died out about 10,600 years ago. It is famous for its formidable size (about 2.1 meters or 7 feet at the shoulders), and in particular for having the largest antlers of any known cervid (a maximum of 3.65 meters or 12 feet from tip to tip). Some have suggested hunting by man is a contributing factor in the demise of Megaloceros giganteus, but most paleontologists believe that it was not a factor. Deer generally have lithe, compact bodies and long, powerful legs suited for rugged woodland terrain. Deer are also good swimmers. Their lower cheek teeth have crescent ridges of enamel, which enable them to grind a wide variety of vegetation. Deer are ruminants or cud-chewers and have a four-chambered stomach. Nearly all deer have a facial gland in front of each eye. The gland contains a strongly scented substance called pheromone, used to mark its home range. Bucks of a wide range of species open these glands wide when angry or excited. All deer have a liver without a gallbladder. Depending on their species, male deer are called stags, harts, bucks or bulls, and females are called hinds, does or cows. Young deer are called fawns or calves. Deer differ from other hoofed mammals in that they have antlers; other ruminants have horns. Antlers are growths of bone that develop each year, usually in summer. The males of most species develop antlers, and generally it is only the males that develop antlers, with the exception of the caribou (also called reindeer), in which females also have antlers. A young buck's first pair of antlers grow from two tiny bumps on their head that they have had from birth. Each year, the antlers grow wrapped in a thick layer of blood-rich skin called "velvet" and remain that way until the bone inside is hard; later the velvet is shed. During the mating season, bucks use their antlers to fight one another for the opportunity to attract mates in a given herd. Antlers are also considered to make the males more attractive to the females by showing maturity and good health. Sometime after the mating season, the antlers drop off and the deer is antlerless until the next summer. The Chinese water deer has no antlers and bears upper canines developed into tusks. Roe deer fawn 2-3 weeks old. 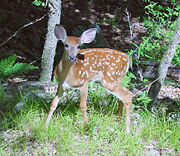 A female deer generally has one or two young (fawns) at a time (triplets, while not unusual, are much more infrequent). The gestation period varies between five and ten months, depending on the species. Most fawns are born with their fur covered with white spots, though they lose their spots once they get older (excluding the fallow deer, which keeps its spots for life). In the first twenty minutes of a fawn's life, the fawn begins to take its first steps. Its mother licks it clean until it is almost free of scent, so predators will not find it. Within a few days, a fawn is able to walk, and by three weeks it can run and jump. The fawn and its mother may stay together for about one year. They then go their separate ways. 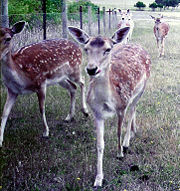 A male usually never sees his mother again, but females sometimes come back with their own fawns and form small herds. Predators of deer include wolves, bears, and cats such as tigers, jaguars, and pumas. Deer have very well developed senses of sight, smell, and hearing and are almost always on the alert for danger. Their swiftness and agility allows them to escape from most encounters with predators. However, they can also fight back when cornered, more often by kicking than with their antlers. Female moose, especially, will fight to defend their young and can be very dangerous to humans (Geist 1999). Deer have long been important to humans. In prehistoric Europe, before the beginning of agriculture, the red deer, was one of the two most widely hunted large animals; the other being the wild boar. Besides the meat, the skin and the antlers of deer were also valued. Since an antler is solid bone, in contrast to the leg bones which are hollow, it is one of the strongest natural materials and was used for digging tools, handles of axes, and many other uses (Clutton-Brook 1999). Today, deer still provide many products for human use. Deer skin is used for shoes, boots, and gloves. Antlers are made into buttons and knife handles and used in traditional medicine. Deer meat, called venison, although not as popular as in earlier times, is still eaten by many. Most commercial venison in the United States is imported from New Zealand, where deer farms number more than 3,500 with more than 400,000 deer in all. The Saami of Scandinavia and the Kola Peninsula of Russia and other nomadic peoples of northern Asia domesticated, or at least semi-domesticated, reindeer and used them for food, clothing, and transport. The moose and the red deer have also been tamed, with the moose even used as a riding animal, but have never been fully domesticated (Clutten-Brook 1999). In North America, most species of deer were hunted almost to extinction by the beginning of the Twentieth Century, but then made a great comeback. The white-tailed deer especially has done well and is now found from northern South America to the southern tip of Hudson Bay in Canada. Some of the factors that have helped deer are restrictions on hunting, the reduction of predators such as wolves, and the opening up of the forest by logging and clearing of the land for farming (Forsyth 1999). 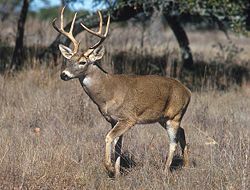 Some species of deer continue to be among the most popular animals for hunting. Two million white-tailed deer are shot by hunters every year in North America, as well as many mule deer, moose, and elk (Forsyth 1999). It has been mainly for the purpose of hunting that species of deer have been introduced to areas where they are not native and sometimes this has caused problems, including the destruction of native plants, competition with native animals, and the spread of disease. The red deer, or elk, is listed as one of the world's 100 worst invasive species by the Invasive Species Specialist Group (ISSG 2006). "Whoever considers themselves beautiful after seeing me has no heart." There are about 40 species of deer worldwide, divided into two broad groups: the Old World deer includes the subfamilies Muntiacinae and Cervinae; the New World deer, the subfamilies Hydropotinae and Capreolinae (or Odocoileinae). 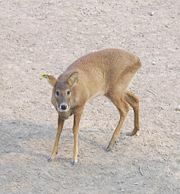 Note that the terms indicate the origin of the groups, not their modern distribution: the Chinese water deer, for example, is a New World species, but is found only in China and Korea. It is thought that the New World deer evolved about 5 million years ago in the forests of North America and Siberia, while the Old World deer evolved in Asia. Biologists have until recently stated that Red Deer (Cervus elaphus) and Elk (Cervus canadensis) are the same species, namely Cervus elaphus, forming a continuous distribution throughout temperate Eurasia and North America, based on fertile hybrids that have been produced under captive conditions. Animal behavior is generally different in captivity than in the wild, and the assumption that the same results would happen in the wild as in captivity is not necessarily the best test methodology to determine speciation. Recent deoxyribonucleic acid (DNA) studies conducted on hundreds of samples from Red Deer and Elk subspecies determined that there are three distinct species and divides them into the East Asian/North American Red Deer (Elk or Wapiti) (Cervus canadensis), Central Asian Red Deer (Cervus affinis), and European Red Deer (Cervus elaphus). Gould, S. J. 1977. The misnamed, mistreated, and misunderstood Irish elk. In Ever Since Darwin. W.W. Norton, New York. Huffman, B. 2006. The Ultimate Ungulate Page. (accessed November 28, 2006). Invasive Species Specialist Group (ISSG). 2006. Global Invasive Species Database: "Axis axis"  "Cervus elaphus" (accessed November 28, 2006). This page was last modified on 30 October 2008, at 21:50.